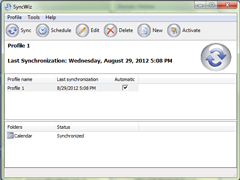 I *am* enjoying SyncWiz a LOT. I also think 4team have great customer service. I bought another product by accident and customer service team quickly reversed the transaction and called me to let me know. Great service, bit disappointed that it is still going to take us so much manual entering to get the desired result and the gogle contacts arent sorted by categories like the outlook ones are etc but I suppose technology is never perfect! The product is wonderful and satisfied exactly what was needed. As a former programmer and beta tester/manager I purchased your product after I saw how well it integrated into Outlook 2007 on Windows 7. I've tried several other solutions, but liked yours the best. Nice program, works well, easy use, I'll buy this and duplicates removal program from this company for sure. Great way to import/export contacts and calendars if you are using Palm. Your company should be complimented for employing people like Andrew.